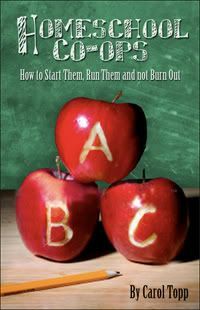 I just finished reading Carol Topp's book Homeschool Co-ops: How to Start Them, Run Them and Not Burn Out. I first met Carol here at HSB. She was the first person that I had ever met (even if it was just online) that discussed the financial side of homeschooling... taxes, IRS, and the whole gamut of questions that an audience of homeschoolers could throw her way. Always knowledgeable (and approachable), I have learned much from her over the years (thanks, Carol!). While I have never been a member of a co-op, I was thinking about getting together with one or two other families to have either an art class or science class-- the two subjects that have sadly fallen by the wayside in our homeschool. Carol's book came at the perfect time! Carol's writing style is very easy to read. It didn't take extra energy (that I did not have) to just get through the book-- I actually enjoyed reading it! Included in her book are real life stories and situations. Not only does it make things more interesting, but you can tell the book contains her personal experience with co-op's along with the experience of other homeschoolers. As you would expect from a CPA, the book is very well organized. Nothing irks me more than a book with no flow and no sense in the order of chapters. and How to Avoid Burnout. Examples of various forms, mission statements, etc. are included. She also has very pointed questions to ask yourself in each chapter. Not one to just convince you that a co-op is for everyone, Carol helps you to see the many benefits of a co-op as well as to count the cost.